Next time you decide to have a card reading, realize the tarot does not only fascinate you but celebrities such as Demi Moore and Cameron Diaz, Cameron was actually spotted having a gypsy card reading only the other day. The fascinating images depicted on the cards hold our rapt attention, but when we visit a New Age outlet to choose our own pack, we find so many diverse types it is often hard to choose. Perhaps those new to tarot are unaware that a card reading done with the 78 cards in the deck are a perfect mirror of humankind’s spiritual journey and that the secret code within the tarot reflects our unconscious mind. It is said the Knight Templars brought back the first tarot cards when they returned from the Crusades in the Middle East. The metaphysical mores of Ancient India are also deemed responsible for the artistic metaphors of the cards, and Ancient Etruscan creativity might have also been woven into their imagery also. Notwithstanding, a card reading expresses such significance because the images illustrate the human condition. Aleister Crowley was not only an infamous 19th century occultist and self proclaimed yogi with a bad boy reputation, but “The Wickedest Man in the World”. This so called “evil” man, reputedly practiced black arts. 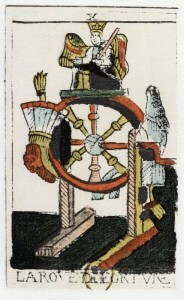 Loathed by the media and the general public, he still managed to create a wonderful set of cards called the Thoth Deck. It has to be said, Crowley probably incarnated in the wrong century. He would have been far more appreciated in the “Swinging Sixties! Yet a card reading with Crowley would have been your “out of the ordinary” experience “par excellence”. Psychics who will do a card reading using Crowley’s deck are usually metaphysically advanced, and more than aware of the Egyptian and Greek magical symbolism contained within them. They are also aware that a Thoth card reading will project a clients’ archetypal force into the interpretation, and therefore be very powerful indeed! Another Tarot deck that can give us a fascinating card reading are the fabulous, hand painted Italian Visconti cards, created during the 14th century for the Duke of Milan. Other Italian packs are of such historic value that they are stored in the British Museum. The Visconti cards are larger than normal and the medieval images reflected on them are evocative of times gone by. They “talk” to a hidden side of us, and our dream worlds! The most popular deck is the fabulous Golden Dawn created by Dr Arthur Edward Waite. The well known Rider-Waite cards are simple to interpret therefore good for your beginner’s first card reading. They are expressive, colourful and simply drawn yet still contain a wealth of occult symbology, spiritual significance and metaphysical insight. Waite called upon the artistic talents of his artist friend Pamela Colema Smith to create the cards themselves, and made sure the imagery connected to our “collective unconscious”. The “Forces that Be” or if you like the “Gods” could be said to have an invisible effect on the cards themselves, whether you believe this or not a card reading should not be perceived as frightening but rather an experience of major insight. The imagery can also be used as a healing tool to transform our “perception” of reality with our seemingly random choice of cards. So a card reading can be a lot more complex that we give it credit for and more profound than we could ever dream possible!